To get the latest information on particular roads in the Yosemite area (but not inside the park), call the CalTrans hotline at 800-427-7623 or 916-445-7623. State the highway number you're interested in and you'll hear a recording of the latest conditions for that road. You can also visit the CalTrans Road Conditions website and type in a highway number to see any current restrictions for that road. For the most complete and up to date information on all the roads inside Yosemite, call the park at 209-372-0200 and select '1' from each of the first two phone menus. The National Park Service website's current conditions page includes information on which roads inside the park are closed, but you'll have to call if you want to know about current chain requirements, hours the Hetch Hetchy road is open, or details about general road conditions. If you have questions that the phone recording and current conditions page didn't answer, try calling the NPS public information office at 209-372-0200 (select 3 and then 5 from the first two menus) to speak to a ranger. The line is open from 9 to 5 Pacific time. You can also contact the park service via email or snail mail; see the NPS contact page for details. R1: Tire chains or traction devices required unless you have snow tires. R2: Tire chains or traction devices required unless you have snow tires and 4-wheel/all-wheel drive. R3: Tire chains or traction devices required on all vehicles. Any time chain controls are in effect, all vehicles must carry chains, even if they have snow tires or 4-wheel drive and the current chain requirements are only R1. There's no "but this is a rental car!" exemption, unfortunately. The NPS chain controls page	specifies that you should expect to be required to carry chains from November through March, and chains may occasionally be required as early as September or as late as May. More Links: You can usually glean some additional enlightenment about Yosemite conditions from the Yosemite webcams and the Yosemite weather forecast. CalTrans also hosts a winter driving tips page. Buck Meadows: The Blackberry Inn keeps a selection of tire chains on hand for guest use. Local businesses are prone to changing their policies or even going out of business altogether without notifying this site, so it's best to call ahead to confirm whether or not they're still selling chains. Highway 41: This highway leads from Fresno through Coarsegold, Oakhurst, and Fish Camp to Yosemite's south entrance, then on into Yosemite Valley. It peaks at about 6,000 feet (1,800 meters) elevation at the Glacier Point Road turnoff, and tire chains are frequently required in the winter. Highway 120: This highway enters Yosemite from the north, near Hetch Hetchy, where it's known as the Big Oak Flat Road, then turns east at Crane Flat and becomes the Tioga Pass Road, eventually exiting Yosemite in the east at Tioga Pass. If you continue south instead of turning east at Crane Flat, you'll descend to Yosemite Valley, though you'll technically be on highway 41 rather than 120 here. The stretch of 120 from Crane Flat to Yosemite's eastern entrance, also known as Tioga Road, reaches nearly 10,000 feet (3,000 meters) elevation and is usually closed altogether from early November until late May or early June. See the table below for past opening and closing dates. If you take 120 from the north (Big Oak Flat) entrance to Yosemite Valley, you'll peak at just over 6,000 feet (1,800 meters) elevation, and you'll need to carry tire chains in the winter. Highway 140: This road runs east from Merced through Mariposa and El Portal into Yosemite Valley. Because it proceeds upstream through the Merced River canyon, its peak elevation is at Yosemite Valley (4,000 feet/1,200 meters). If you're worried about winter road conditions, this is the route to take to Yosemite. It's required to carry tire chains on this road in the winter, but you're much less likely to need them than if you're driving on 41 or 120. Highway 49: The gold-rush highway heads north, parallel to Yosemite, from Oakhurst to I80 at Auburn. If you've decided to get around winter road issues by entering Yosemite via 140, you may end up taking 49 to Mariposa to reach 140. Snow and ice on 49 are rare but not unheard of. Highway 395: This is the major north-south artery east of Yosemite. It goes north to Reno and south nearly to San Bernardino. It intersects Road 120, the Tioga Road to Yosemite, at Lee Vining, 10 miles (16km) east of Yosemite. Which winter route into Yosemite is least likely to require tire chains? The Tioga Road. Not only will you not need tire chains, but you won't even need a car, because the road will be closed. If you insist on driving, though, Highway 140 is the best bad-weather choice. After going over a 2,300-foot pass near Midpines, it dips into the Merced River Canyon and proceeds upstream, peaking in elevation in Yosemite Valley	at around 4,000 feet (1,200 meters). Your other two options, approaching from the southwest via Highway 41 or from the northwest via Highway 120, both climb to around 6,000 feet (1,800 meters) before descending into Yosemite Valley. What Sorts of Things Can Go Wrong with the Roads in Yosemite? 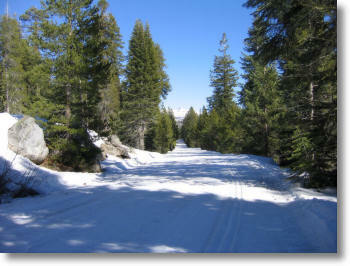 The biggest road hazard in Yosemite is snow and ice, which is common in the winter. Plan on carrying tire chains if you're making a winter visit. Road closures are rare in other seasons, but not impossible. Highway 140 was closed for much of the summer of 2006 because of a rockslide, for instance, and roads can be closed due to forest fires, particularly in the late summer. Beware of construction delays, as well. Yosemite Valley in the winter is often a labyrinth of detours as the park service scrambles to fit in all its construction, maintenance, and controlled burns before the summer crowds return.